Are you looking for a new tool for authoring eLearning? Content authoring tools vary widely in their capabilities. Many are specialists – converting PowerPoint presentations, capturing screens, preparing quizzes and assessments, developing mobile modules, etc. Some are desktop programs for individual use and others are web-based for collaborative authoring. A few are fairly comprehensive. 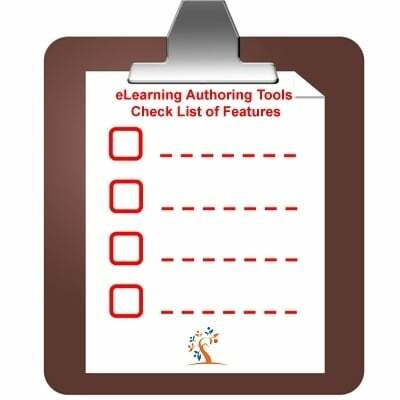 What are the most important features in an eLearning Authoring Tool? Share you opinion with us by leaving a comment! Logical process of creating a course or module. Does it use a design model that designers are comfortable with? This is especially important if it is a new tool and users are less experienced, slightly less important if users are experienced instructional designers. Intuitive and logical are subjective and should be checked out with a variety of potential users. Will it work well with your LMS? Is it a tool recommended by your LMS provider? Have they demonstrated the integration? Individual desk-top or web-based collaborative tool? If collaborative, does it support the kinds of collaboration you want? Learning object repository and/or other tools to help manage collaborative authoring. SCORM/AICC conformance? Tin Can API integration? Will it allow you to go outside of SCORM if necessary? Inclusion of standard templates and ability to create your own. Ability to publish to a variety of formats including HTML, XML, Flash, HTML5, etc. Blended learning – will if fit easily into scenarios where learners are also accessing other modalities such as classroom courses, labs, live virtual classes, etc.? Multi-media – video, audio, animation, avatars. Does it have built-in tools for these or do you need external tools? Are these tools easy to use? There are many formats used for these – what are your preferences or standards? Will it create modules from PowerPoint, Word, or other standard software being used? Caveat: Bad PowerPoint presentations (the great majority) make even worse eLearning. Screen capture – still and video for software simulations. Ability to create social simulations as well as software simulations. Can you import from or export to other authoring platforms that others may be using? Is the look and feel of the output customizable – themes, styles, colours, branding, etc. so it fits with your HR/learning portal and LMS? Does it provide for flexible navigation by learners – course outline, table of contents, glossary, FAQ, ability to jump anywhere in the “course”? Can learners personalize the look and feel? Can you control the path the learner takes or leave it completely open? You may want to make that choice. Branching – based both on learner choice and results on tests. Adaptive – will it lead learners through a quicker path or to an enhancement module if they do well on tests or to remediation if they don’t do so well? Is there a print and save capability for learners? Kind of feedback on tests – score on whole test, response with correct answer on each question, no feedback, chances to retake quizzes – the option to choose among these. How are tests scored? – learner self-assessment? Does the score go on learner’s record? Can you make that choice? Are there add-on modules for additional capabilities when you need them? Can learners take the course offline? Performance support – is it “chunkable” into small objects that can be retrieved by learners at the point of need. Mobile learning – does it provide tools for this? Not just HTML5 output but guidelines and templates for adapting to the small screen of most mobile gadgets. Does it provide for different languages? What other features are you looking in an content authoring tool? Share you opinion with us by leaving a comment!